At least one web site has begun displaying Indian FTR 1200 photos, and specifications. We thought the official unveil was scheduled for tomorrow, but it is now out in the wild! This is no cruiser, okay? 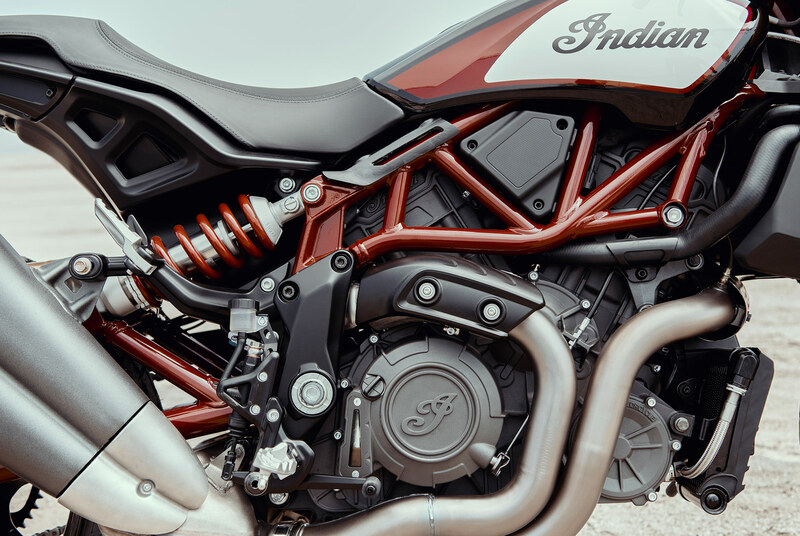 After taking the flat track championship this year (not just “taking”, but “dominating”), Indian is giving us a true, high-performance motorcycle. Although we thoroughly enjoyed the punched-out, 1179cc twin in the Victory Octane we tested last year, that unit’s 104 horsepower pales compared to the reported output from the FTR 1200. 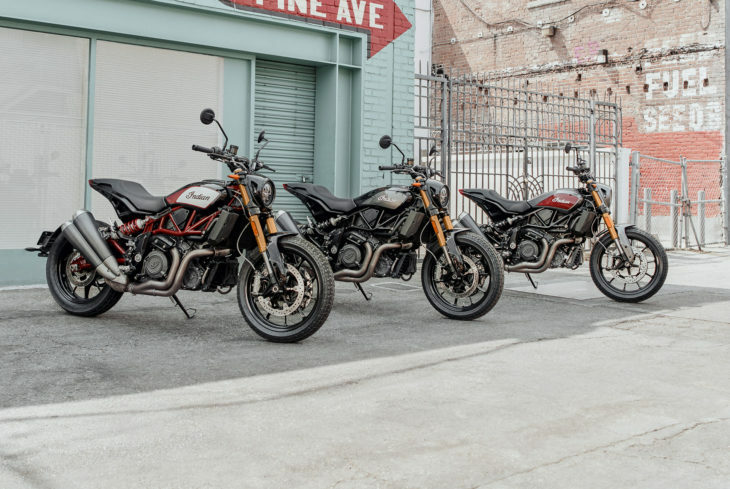 The new v-twin reportedly displaces 1202cc and, in a machine weighing less than 500 pounds, makes a claimed 120 horsepower and 85 foot/pounds of torque. The pictures reveal some nice kit, including Brembo brakes and, on the higher trim level, a modern TFT instrument panel. I grew up racing motocross and hair scrambles. I’m not an old hippie looking to cruise around at 50mph…yet. I still like to RIDE hard and this bike looks fun. The old Indian company died and these people are trying their best to bring it back so I’m willing to give it a shot. I like the FTR as a fun bike, the Scout Bobber as a solo cruiser and the Chieftain Dark Horse as a bagger. I’ve had Vrods, superglides and still have a streetglide. They all lose $5000 the second they roll off the showroom floor and I’m not real happy with Harleys attitude. Harley only survives off die hard bikers and middle aged wannabees, they sure don’t out perform and ride better than everything else out there. Harley needs competition to make them better and maybe the new Indian co will be the one to give them competition. If that improves the bikes we all win. After staring at and literally obsessing over the concept bike, lo these many months….this production bike falls flat.Too many concessions had to be made to satisfy the evil members of the production committee, IMHO. I would’ve immediately bought the concept bike, had it made it to market and spent the rest of my life admiring the design in between romping around the canyons and taking it out on pointless jaunts of my creation. The Akrapovic pipes improved my later model Vrod, seemed like a completely different bike. 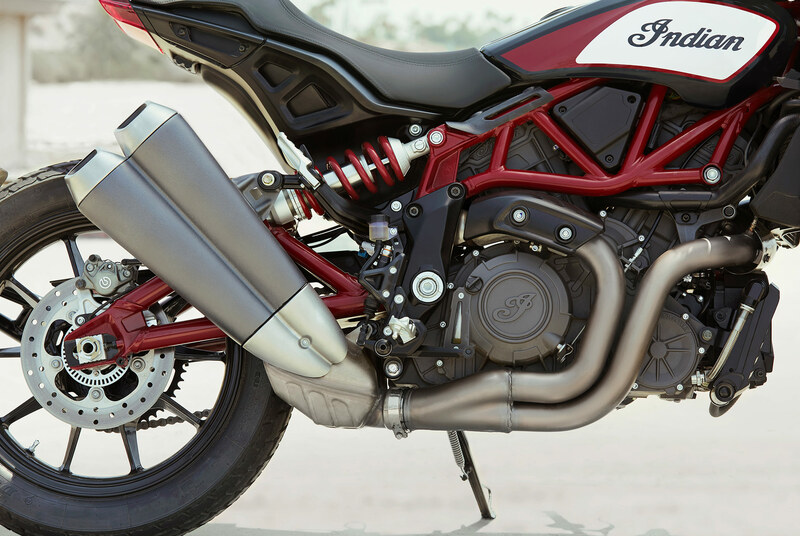 I know there are a few factory options for slipons but I hope Akrapovic comes up with a complete new pipe. I’m not dropping 50k on a FTR750 so I’ll make this one work. 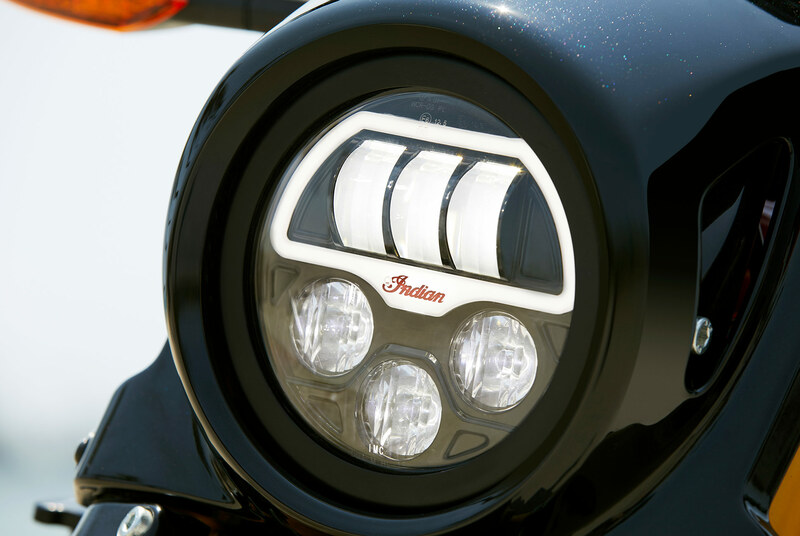 Look for Indian Motorcycles to last another, maybe two years. Maybe you should be prepared to be disappointed, I’m seeing more than a few Indians pop up around my area, where in the last few years, I hardly ever seen any. You a Harley lover Bubba? I see lots of Indians around here – mostly the big Chiefs but also a few Scouts here and there. I think they are probably here to stay. I’ve seen two in the last three years and had to travel 150 miles to see those. I don’t think they were from my area. Both were the large Indians. Have only seen one Scout in my area. Belongs to a friend, he put a sidecar on it. Test rode a Scout. Nice motor and trans, terrible suspension and seating position. Test rode one of the big Indians. Cumbersome in a parking lot and it’ll roast your ‘nads after a short ride. That big motor is impressive looking. To me Indians are just “meh”, this one included. I admit that it could be that I am seeing many because they are all coming from somewhere else. I live in a pretty popular motorcycling destination. Do we get to point fingers and mock you derisively when you’re wrong? Our local southern Ohio Indian dealer went out of business. I think there is one in northern Kentucky somewhere. I have never seen a Scout on the road, I have seen a couple of the Chiefs. I don’t know if they will go out of business as a company, but I don’t think they are doing as well as Harley Davidson, who is also floundering. Hey, I mean if it happened in southern Ohio,it must reverberate around the world. Videos of this bike are now popping up with detailed 360 views. Alright, I’ll go on the record right now that I LIKE the exhaust system. It is in your face styling, so what’s wrong with that? 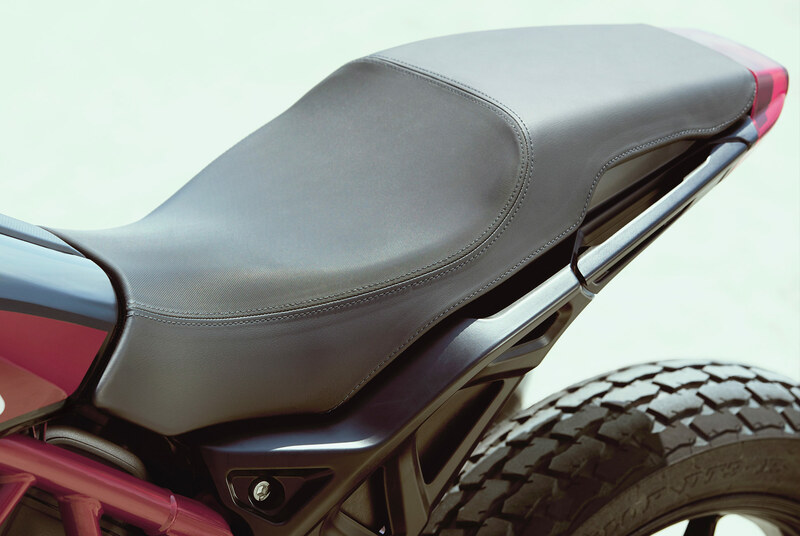 Some have complained about the smallish gas capacity, and the shorty rear fender. Well folks, this is patterned after a mile bike, what do you expect? It seems like no matter what bike is introduced, or how good it may be, somebody is always going to complain about something. This isn’t meant for touring or even riding any kind of long distance, sport bikes can claim this same type of focused intent. I think Indian did a great job with this bike bar nothing. A little less expensive, sure, I would like to see that, but I’m sure it won’t be made or purchased in large volumes, I don’t think that was the intent either. I’m sure this bike will be more impressive in the flesh than just pictures. Go Indian! So RK, are you going to buy one? If I had the disposable income for it, you bet! I believe I read elsewhere that the wheels are 18″ rear and 19″ front. Beautiful bike with good performance and high quality finish , even has cruise control! This is one cool and exciting motorcycle , by far the most interesting novelty so far this year. Congratulations Indian! Cruise control on a bike with a tank so small you’re not likely to go anywhere worth using it on. Indian must’ve borrowed that stupidly useless feature from Triumph’s Speedmaster cuz it too has cruise control and a dinky fuel tank. 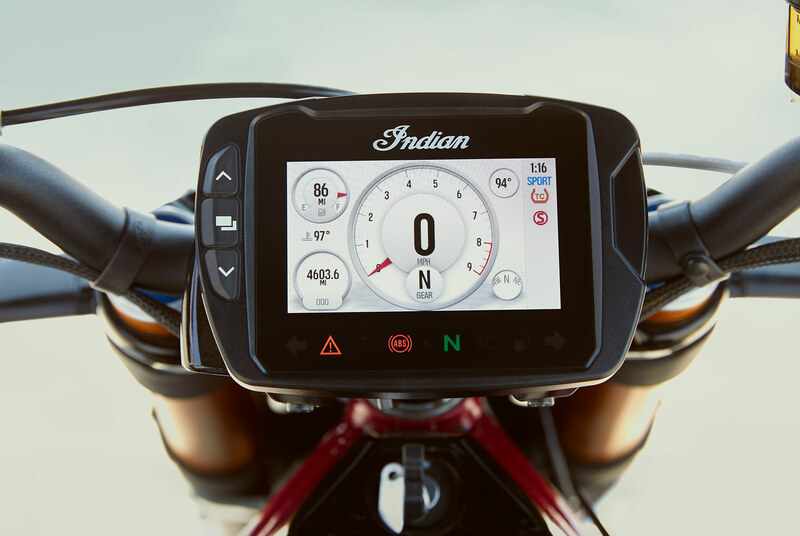 I think HD’s new standard is probably the bike to compete with this Indian, though a serious effort on their part could perhaps come up with a platform for their 750 and 500 engines to make a lither, cheaper option along these lines. I don’t think this compares favorably to the Monsters. Personally, I think it’s difficult to compare it to anything currently out there. 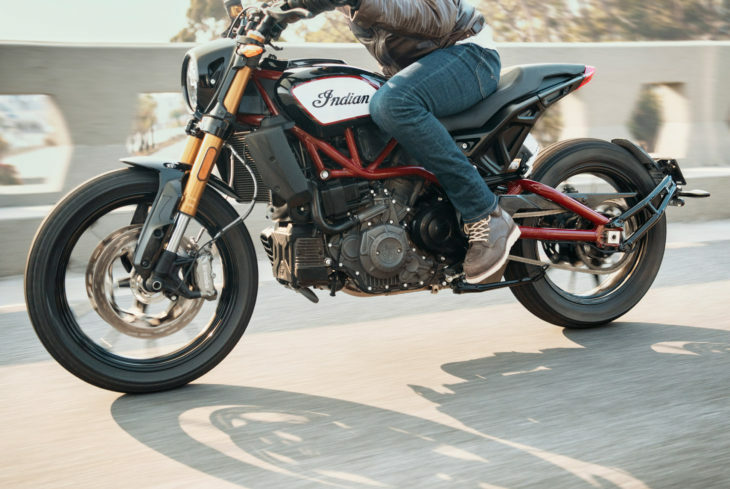 Yes, a Monster S is lighter and has more overall performance, but it also costs $3K more (S vs S)…and I doubt many Ducati owners are willing to start taking their 18 thousand dollar bike down some fire roads. It really depends on where an individual sees value. Interesting strategy by Polaris, really. Build a bike that really can’t be directly compared 1-1 against anything currently on the market, but clearly dominates anything currently made in America, at least until HD’s Pan America comes out. We’ll see how it works out for them. 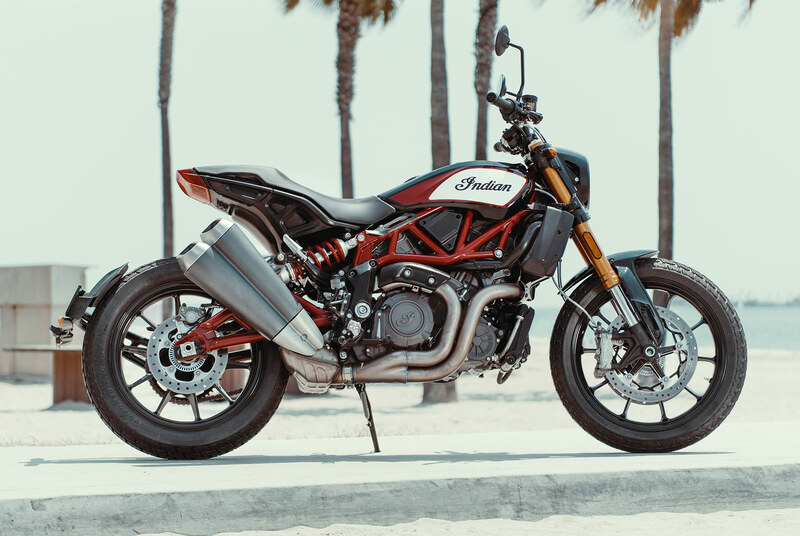 Re: Monsters, from a performance standpoint I full agree, yet I find myself very much more interested in this Indian than a Monster or KTM 1290 Super Duke (still called that?) or any other sporty big twin, and I’m not sure why. I’m not a big ‘Merica! type and do think once bikes get over about 450lbs you’re getting a bit porky, but I’m drawn to this. Current rides include a 1948 Indian but that’s just to shut the Harley guys up (may be pertinent here) and a Ducati Sport Classic with semi-flattrack bars and cocktail shaker pipes. Sorta-kinda like this FTR. Any analysis welcome. Because no one else makes v-twin sport bikes like maybe Aprilia, KTM, and Suzuki? Too easy…. I keep looking at the engine and wonder if it’s even possible to adjust the valves on this bike without taking the entire bike apart. Hopefully it has hydraulic adjusters. 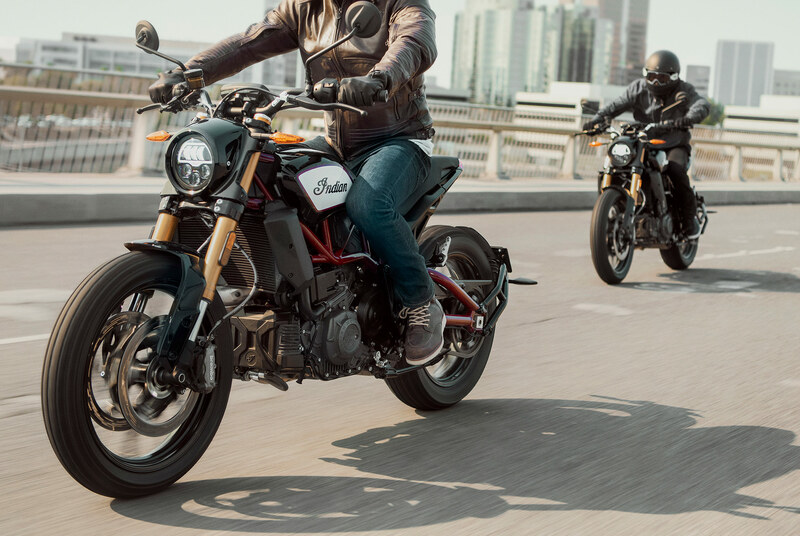 Looks like it would be the same as most bikes with V-twins and a perimeter/twin-spar frame – you take the tank (and maybe some other stuff – airbox? – off) and come in from the top. At least the narrower (60 degree?) 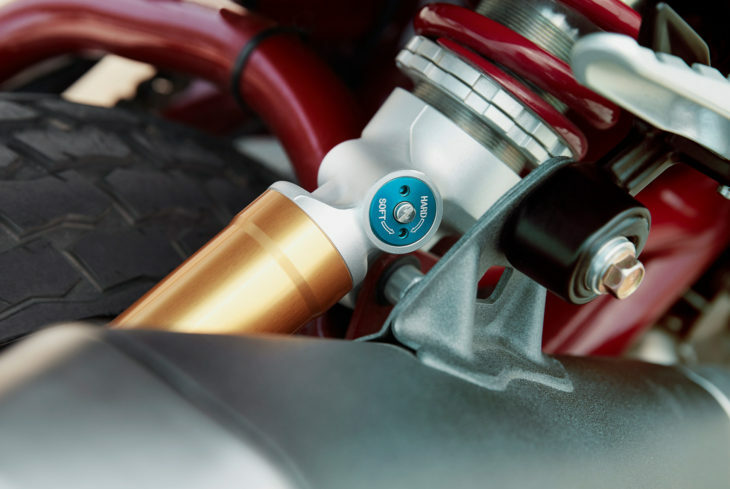 vee angle doesn’t leave the rear cylinder nearly horizontal as it does on 90 degree v-twins. The Scout engine uses graded tappets due to the rpm limits of hydraulic lifters. Clearance checks are recommended between 20K-30K miles. On a normal Scout, removal of the tank and airbox are required. Not sure if that would be different with this trellis frame. The Rotax-Buell was a major PITA for valve adjustments, as in easiest way is to remove entire chassis/front end from engine/swingarm and be able to cram everything back together again. Cram being the operative word.